Background: Farnesol is an acyclic sesquiterpene alcohol, endogenously synthesized via the ergosterol pathway. It is a quorum sensing molecule (QSM) that was first discovered in C. albicans, and is involved in the inhibition of hyphae formation. Methods: This review focuses on the comprehensive details of occurrence, chemical/biological synthesis of farnesol and its derivatives, and the factors involved in the regulation of their production. Further, the review also presents their cellular functions and diversified biomedical applications. Results: Large-scale production of farnesol can be achieved using chemical synthesis and metabolic engineering approach. 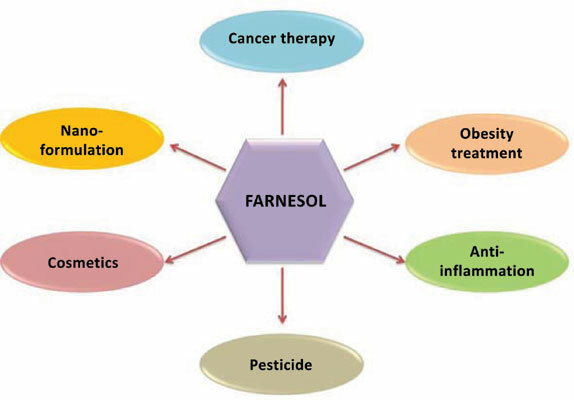 Farnesol is involved in the regulation of various physiological processes including filamentation, biofilm development, drug efflux, and apoptosis, etc. Farnesol and its derivatives/ analogues have also been reported to exhibit anti-biofilm, anti-cancer, anti-tumor and fungicidal properties. The antimicrobial potential of farnesol has been enhanced by synergizing it with known antifungal drugs, and also through nano-formulation(s). Conclusion: Apart from its quorum sensing activity, farnesol can be used as an effective anti-microbial, anti-inflammatory, ant-allergic, anti-cancerous, and anti-obesity agent. Antimicrobials, Biofilm, Farnesol, Molecular signaling, Quorum sensing, QSM.